Instructions: Prepare a 5 x 7" white card base and layer it with a piece of the Tweet Cherry Blossoms Paper. In the upper left hand corner of the designer paper, lay your stencil down and use a small amount of the Nuvo Toasted Almond Mousse. On white cardstock stamp the bench and watering can from the Wishing Well Oasis set with the black ink. Use the coordinating die and cut both out. Use the coffee ink and lightly color the bench. Add a foam dot to the back of the watering can and adhere both the bench and watering can to the card. 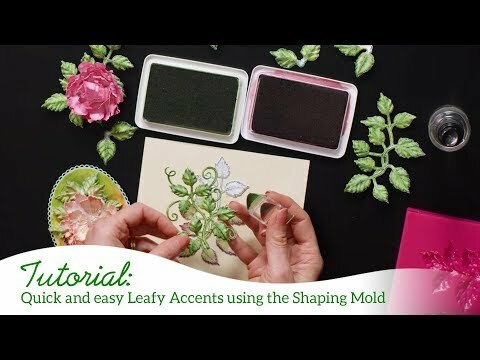 Stamp all the Oakberry Lane leaves and the Leafy Accents leaves on white cardstock with the Leaf Green ink, color in with the vivid Chartreuse ink, use the coordinating die and cut everything out, use the mold to shape the leaves, adhere to the card. Stamp the Tweet Cherry Blossoms on white with the coffee and color the centers with the Buttercup ink, cut out with the matching die, shape in the mold and adhere to the card. To finish, add glitter to the leaves and flowers.